My friend Michael brought his pasta machine over last night (on his bike, no less) and we embarked upon the the most adventurous meal I’ve made in awhile. I will not lie to you—this dish takes a long time to make. We started around 7:30 and didn’t eat until after 10, but it was well worth it. 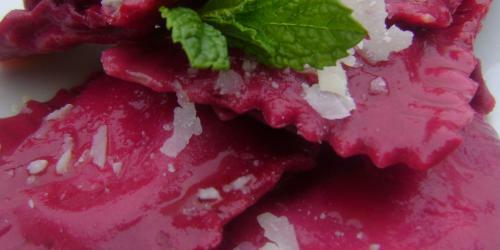 Tender beets keep this pasta very moist and give it a beautiful purple color. Goat cheese, a natural pairing for beets, is absolutely perfect with fresh mint, and the ricotta keeps it from being overwhelmingly rich. Note: if you don’t have a food processor, you can still make the dough—just mash the beets well with a fork and mix the dough in a bowl with a wooden spoon. 3/4 cup semolina flour $4 for 12 oz. 1/4 cup ricotta $3 for 10 oz. 1/4 cup goat cheese (chèvre) $3.50 for 6 oz. Drizzle 1 tbsp olive oil over the beet and place it on a baking sheet. Roast until tender, approximately 45 minutes. While beets roast, combine the ricotta, goat cheese, mint, 1 tbsp olive oil, salt and pepper to taste. Set aside. Once cooked, place the beet(s) under cold running water to cool down and carefully remove the skin (it should just fall off). Cut beet(s) into chunks and place in a food processor. Pulse until smooth. Add the eggs and 1 tbsp olive oil and pulse until incorporated. Add the salt. Slowly add the flours and run machine until a smooth dough forms. You may need to add more all-purpose flour to achieve a dough that is elastic enough that it doesn't stick to your fingers. Remove the dough from the food processor and turn out onto a floured surface. Knead 10-12 times to ensure an elastic dough. Press dough out into an 8" circle. Cut circle into 4 even strips. Using a rolling pin, roll each fourth to about 1/16-inch thick. If you have a pasta machine, use that to roll out your pasta. Each strip should now be about 18" long and 4" wide. Keep strips on a floured surface and avoid stacking them so they don't stick together. Cut a 18" strip in half so you have 2 9" strips. Evenly place 4 dollops (approx 1 tbsp) of the mint-cheese mixture on one 9" strip of dough, approx 2" apart. Cover with 2nd 9" strip, making sure to line up edges. If you have a ravioli stamp, use that to cut the raviolis. Otherwise, use a knife to cut each ravioli into 2 1/2 x 2 1/2 square. Use a fork to gently press the edges to ensure a tight seal. Set finished raviolis on a lightly-floured plate. Bring a large pot of salted water to a light boil. Drop raviolis in, 6 at a time and cook, 2-3 minutes or until they float (taste one to be sure they are fully-cooked). Place cooked raviolis in a large bowl. Cook in batches until all are cooked. Drizzle 2 tbsp olive oil over the ravioli and very gently toss with tongs. Divide onto plates. Garnish with Parmesan if desired. OMG. OMFG. I need to make this! A couple of years ago my husband and I went to a French resteraunt for Valentines day and I had the most wonderful beet amuse bouche. So I had to try something with beets at home so I started making beet mashed potatoes. Ever since I have a beet fascination. This is PERFECT and I can’t wait to try it. Nice post. I learn something new and challenging on websites I stumbleupon day-to-day. It will always be interesting to read through content material posted by authors and practice something from other web pages. Nice post. I learn something new and difficult on blogs I stumbleupon regular. It’s always useful to read simple things written content from other internet writers and use a little something from their web sites. Good post. I find out something new and difficult on websites I stumbleupon on a daily basis. It’s always fascinating to study content material from their freelance writers and use a little something from other sites. Good read. I find out something new and difficult on articles I stumbleupon day to day. It’s always fascinating to learn content material from other editors and use something from their web sites. Good read. I find out something totally new and difficult on blogs I stumbleupon regular. It’s always interesting to learn written content from the writers and use something from their sites. Good post. I find out something new and difficult on blogs I stumbleupon daily. It’s always useful to read through content material posted by freelance writers and use a little from other web-sites. Good read. I find out something totally new and difficult on sites I stumbleupon daily. It’s always exciting to read simple things content from the authors and practice a little from other internet sites. Nice post. I learn something new and difficult on sites I stumbleupon day to day. It will always be exciting you just read written content from all other freelance writers and use a little from their online sites. Good post. I find out something new and challenging on sites I stumbleupon everyday. It’s always intriguing to read simple things content from all other authors and use something of their sites. Good read. I learn something new and challenging on websites I stumbleupon on a daily basis. It’s always helpful to read through content material posted by freelance writers and practice something of their internet sites. Nice post. I find out something totally new and challenging on articles I stumbleupon on a daily basis. It’s always intriguing to read written content from their writers and use a little something from their web sites. Nice post. I learn something totally new and challenging on websites I stumbleupon every day. It’s always helpful to study material from other writers and use a little something from other websites. I happen to be commenting to let you know of the cool experience my wife’s princess encountered using your site. She realized such a lot of details, including how it is like to have an excellent teaching style to have the others clearly fully grasp chosen advanced matters. You truly did more than our desires. I appreciate you for presenting the good, dependable, explanatory as well as unique guidance on that topic to Tanya. I truly thank you for the profitable information on this extraordinary subject and anticipate more incredible posts. You“re the best to enjoy this magnificence article with me. I am welcoming it all that much! Anticipating another extraordinary article. Good fortunes to the creator! All the best!